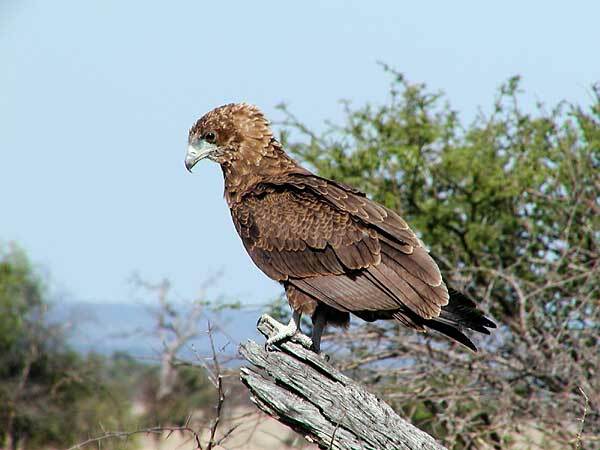 Photo of Bateleur Eagle, Kruger National Park, South Africa. Location: The Kruger National Park is South Africa's flagship wildlife reserve and offers a wildlife experience that ranks with the best in Africa. Established in 1898, the park covers nearly 2 million hectares. As such, it is home to an impressive diversity of flora and fauna, including 507 different birds and 147 types of mammal. In addition to the "Big Five" - elephant, lion, leopard, buffalo and rhino - there are also large numbers of giraffe, zebra, wildebeest, hippo, antelope, and hyena. Less common but also seen by visitors on safari are cheetah and wild dog. Kruger Park is mainly a self-drive destination with a good infrastructure of roads, waterholes, picnic sites, and restcamps. Accommodation options include chalets, cottages, bungalows, tents, caravan and camp sites or bushveld camps, bush lodges and private safari lodges. The official website is http://www.sanparks.org/parks/kruger/.